As capital hill staffer Elizabeth Lauten found out, a facebook post that can take 10 seconds to write, can ruin a career years in the making. Now, it isn’t the worst thing anyone ever write, not by a long-shot. But the president’s children are off limits and she went a bit too far as people viewed her targeting the president’s kids. She was forced to resign, and has likely ruined a promising career. The worst thing I heard was she actually had a business consulting on social media. She should have known better. So, what can you take a way from this? I always advise social media clients to keep politics out of their posts. (Now as Lauten was a political staffer, commenting on politics is part of her job). But for most businesses, they should stay away from politics as half the people may like your posts, but many will be turned off. Do you really want to alienate potential customers just because they have different political views? If you are writing anything that can be taken as controversial, take a breath, read and re-read before posting. This is also a good idea for blog posts and emails. Don’t send in anger. Take a step back, before posting/sending. We have all (me included :() sent emails we should have deleted. 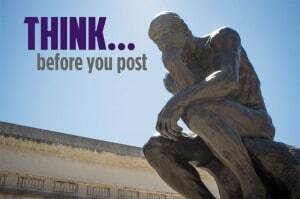 Utilize the 5 minute rule: If you have something you absolutely want to post that may be controversial, walk away, wait 5 minutes before posting/sending. Many times that brief time to reflect will change you mind. In Conclusion: We have all sent emails we wished we hadn’t, wrote something in a blog or a tweet or Facebook post we wish we could take back. But as people find out even their deleted tweets are out there for eternity. In fact, people have found out that deleting a tweet is even worse as everyone jumps on that fact. 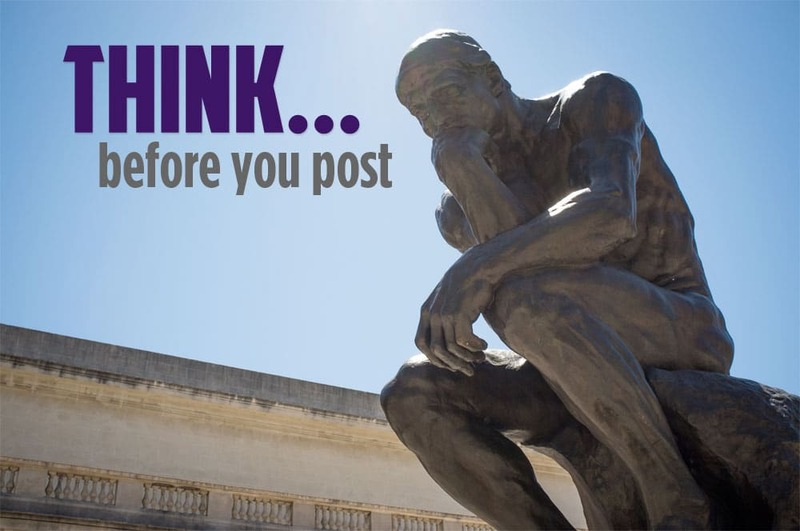 Fortunately, if you follow our advice, and utilized the five minute rule, you can avoid the problems that arise from an inappropriate posting. And, as always you can contact us, we are happy to help with any web, social media issues you may have. 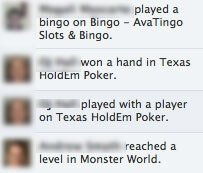 People love Facebook games. Personally I don’t get it and tire easily of them. But of course, everyone has likes and dislikes. The notifications that appear on the right side of your screen can really hurt you. Take for example, the case of your friend who always tells you they are swamped at work. But whenever you are on facebook you notice they are playing a game. Now, what if one of their clients (or boss) noticed this in the middle of a work day? Worse, imagine this person was behind with a deliverable? I don’t know about you, but this would give me a pretty low impression of the person. The problem is that people’s personal and professional lives become intertwined in social media. If a client friends you, you aren’t going to reject them. So be aware. Its one thing for clients to see you listen to Captain and Tennille music on Spotify during the day, it is another to broadcast to the world you are fooling around rather than working.